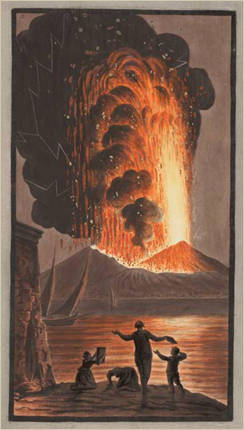 “Eruption of Mount Vesuvius, on Sunday night August the 8th 1779.” by Peter Fabris, a plate to accompany Sir William Hamilton’s Campi Phlegraei (Naples, 1779). This copy: Osler Library (Osler Room), elf QE 523 V5 H222s 1779. Frank Dawson Adams was born in Montreal in 1859. He began his studies in applied sciences at McGill at the age of sixteen, with John William Dawson as one of his professors. After studying in the United States and working for the Geological Survey of Canada, he returned to McGill to receive his MA in geology in 1884. After earning a PhD from Heidelberg University in 1892 he was appointed Logan Professor of Geology at McGill, and served as the first dean of Graduate Studies. He retired an accomplished geologist in 1924 and devoted himself to travel and collecting books, rocks, and specimens. In 1942, Adams bequeathed over fifteen hundred volumes to the McGill Library including many early works on geology, mineralogy, volcanology, and paleontology. The publications date from the fifteenth to the twentieth centuries, with particularly strong holdings in the seventeenth and eighteenth centuries. Also in this collection is Jesuit natural philosopher Athanasius Kircher’s work on magnetism, Magnes, sive De arte Magnetica opus tripartitum (1643 ed.) which, among other things, describes his construction of a magnetic clock. Many significant works by philosophers of science are also represented. Seven titles of the collection are incunables (books printed during the first fifty years of printing technology). Among these is one printed near the end of the fifteenth century (the precise date is uncertain) titled Judicium Jovis in valle amenitatis habitum, by Paulus Niavis (1460–1514), which recounts a trial of a man accused of mining mountains, conducted by the Roman god Jupiter. Published holdings in several areas of the history of science complement this collection: the Redpath Tracts include the Siemens Engineering Collection, which consists largely of nineteenth-century offprints and pamphlets; and the Sir [John] William Dawson Pamphlet Collection contains nineteenth-century offprints and pamphlets on geological and other scientific topics. In addition, researchers can consult the archival papers of Frank Dawson Adams from his tenure as dean of the Faculty of Engineering and vice-principal of the university; and the John William Dawson Fonds of correspondence and professional records.